Today I decided to update my website, which I never seem to have time for anymore. What has it been? Three months? Four again? Forgive me if I go on a little stream of consciousness. Anyway, many people have been probably wondering where I pen my stories. My fiction, my moment of Zen or just overall grooviness. I rarely let people into my life. I like to be left alone. I’m that 40 year old (well, almost) codger who doesn’t like the company of human beings too often. Yes, as antisocial as it sounds, I gave up on the human race a long time ago. We need to be recycled, as corny as it sounds. Those harbored thoughts, which I analyze on a daily basis, while sitting with a cup of Joe on my windowsill, helps to motivate me. Small shards of my inner self, small particles of my inner thought processes are engrained in every single thing I write. You may not notice them at first, or not until a second or third reread. But they are there. Whether one of my stories takes place aboard a giant mechanical shark off the shores of 1880s Victorian New England; or an agoraphobe wakes up to find a beanstalk rising up through his living room ceiling into a homosexual neighbor’s mind; or a nuclear household living the same volatile routine among a lunar base that will lead to forced oxygen depletion, I am embedded in the grains of the virtual ink. Okay, that wasn’t stream of consciousness. It was a plug for a future project. At the moment, I have a collection coming out with a new small press in first quarter 2015 (chock full of short stories, novelettes and novellas) and it will be available in a limited edition print and ebook form, the stories available nowhere else ever but that single tome. Apparently, I’ll also be one of the launch titles with three other authors. Then, there’s a second collection. This one is a fully illustrated collaborative project (my first) — think graphic novel writing — and it’s currently under consideration (and still being written). Then, there’s the gargoyle secret agent novel, on the backburner, which needs to be tended to. Agent would really like me to finish this, but there’s never any time. It’s part of a swansong trilogy, and I’ve never seen a guy show so much enthusiasm in me. And let’s say I did write the first book in 9 months, get a pitiful advance of $2000 or $3000 in the current publishing climate, ends up lasting a month on a B&N shelf until it’s taken down and turned into obscure pulp. I sometimes wonder if there’s a point to any of this; even today’s most legendary publishers and editors rely on Kickstarter campaigns to start projects that, while awesome, will never earn out. For Christ sake, Night Shade is gone; how long till B&N is next? Friend of mine asked me the other day, if you could go back in time would you return to journalism school or your first option, pharmacy school. I said ‘pharmacist,’ a one hundred thousand dollar a year field. In a heartbeat! We live and learn. Thank God for ebooks, I suppose. And simple creativity. 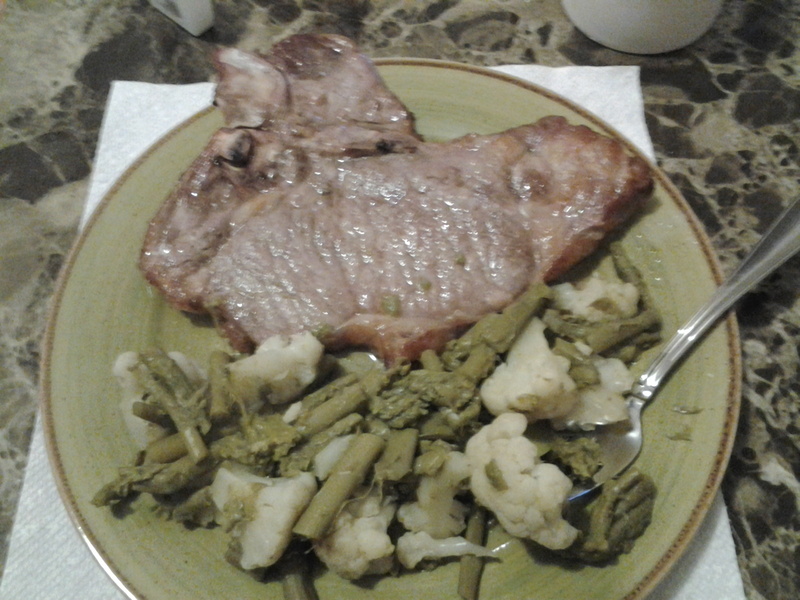 Those are porterhouses on the right, and you can’t go wrong with Birds Eye veggies. The kitchen itself has brand new white wooden cabinets, sanded granite floors and granite-marble countertops for preparing food, and I’m usually always prepared for the zombie apocalypse. You’ll also notice my Alf doll from the 80s on top of the waste bin. I also, in the last year or so, love to cook. Like four days a week. It’s become a passion of mine to make whole grain pastas, meatballs, homemade macaroni salads or tuna noodle casseroles, steaks and center cut pork chops, marinated chickens and broiled or deep fried cutlets. Here and there, brussel sprouts or fresh cauliflower, steamed in a tangy butter sauce (I use regular margarine), with salmon fillet or lamb (when on sale). I experiment with seasonings and homemade recipes. And I just love my chinaware, which is the green plate below, called Amazon (after the rainforest). It’s ceramic with a clay pottery material. Heavy, fragile. For breakfast, it’s Apple Jacks or my personal favorite, Cookie Crisp. You can also see in one photograph I’m making Angus Beef porterhouses (25 to 30 minutes at 400 degrees) with steamed vegetables. I eat steak every week. When I’m cooking, I listen to classical music, video game soundtracks like Final Fantasy, opera or ambient/mood music. Or, my personal favorite, Trance. Yes, I love trance. The living room is small, compared to most one-bedroom apartments (welcome to NY real estate), but for a cozy area to nap, or work on my laptop, or watch TV or play video games, it’s suffice. The couch is black leather, Crate & Barrel. The table is an imitation marble, which I have to Pledge every second. I’m hoping to put an AC in the window real soon. Opposite that, I have two bookcases, and two in the bedroom. But I’ve unloaded a lot of my print books and limited editions (from Asimovs to Analog to 25 dollar hardcovers, I couldn’t even give them away) due to everything being Kindle and Android readers now. I used to own 2000 books and magazines at one point in my life, I’m guessing that number is more like 500 or 600 now. Now I mostly use it for video games and to display collectible toys. The entertainment center is average for a small living room… I don’t have all my video games there, and as a collector and somebody involved in the industry, I’ll do a separate blog post or something displaying my 1000+ game collection from NES up until now. Too long to write about today. Mostly retro. However, below, I’ll put up my favorite system ever made, mint condition, with trusty Express handheld, and I own 45 HuCard games for it. Called the PC Engine in Japan, but over here, the Turbografx-16 Console. Circa 1990. Like I said, it would take another blog post (maybe two or three), and about two spare weekends, just to catalog those four bookcases: video games, toys, genre books, genre mags, encyclopedias, non-fiction, baseball card albums, Yu-Gi-Oh, Star Wars, obscure fanzines. Where do I begin? The print books above, however, are my most recent acquisitions. Doctor Who with the Ice Warriors, and my GF’s sister picked these four pulp scifi paperbacks up for me from a now out-of-business record store called Bleecker Bob’s. Yes, the famous rock and roll institution of Greenwich Village. And Bob himself, now in a nursing home, was a science fiction fan and avid collector and reader. These are Bob’s pulp paperbacks. I used to own The Martian Chronicles (and read it already) in 1986, but mine came from Forbidden Planet and was a later edition. This might be a first, not sure. Nevertheless, can’t wait to dive in. This is the smelliest room in the house. Mornings I occupy this room for about — er, uh, well you know how it is. I eat a lot of fiber. Above that, the bedroom where, sometimes I’ve been known to lock myself for twelve hours at a time and work. Some people have cabins in the woods, others stay in hotel rooms. Me, I have a blue bed. This is another toy. TMNT playset (but for use with Batman figures). Stands four feet tall. I bought this for my son for X-mas 2012. It’s as tall as him. He plays with it when he comes to visit. It took seven hours to put together. The desk in the background fell apart two months ago, thus I’m now writing on a blue bed. My son, summer 2012. He got big. The uppermost pic (the humorous one; okay, they’re all humorous) is me at age 23. I must have been rocking the Tom Selleck look back then or something. That might have been taken at Benihana’s Japanese Restaurant. Friends and I used to eat there a lot. The next two, and rather hipsterish, are February 2013, my living room. Last but not least, friends on Facebook may remember that I acquired two kittens in summer 2012, but I couldn’t take them with me. No pets allowed. Blackey and Trouble (sister and brother). Well, good news. They’re big now, and they’ve found a wonderful home with a cat-loving mom and her little girl in Brooklyn. Please consider giving an older animal a place to live today! With that said, drop by over the next few weeks. Free ebooks, magazines coming out, subscribe. Stuff like that. Always feels weird blogging; like I’m talking to myself or something.